Over the last few years, the frequency and severity of cyber attacks and breaches has exponentially risen. So much so, figures by the Business Continuity Institute (BCI) shows that 53% of UK firms now consider a cyber attack as the main threat facing them in the near future. Price Waterhouse Coopers (PwC) found £857,000 to be the average annual cost incurred by UK firms who have fallen victim to cyber attacks and breaches, any incidents can therefore have adverse and disruptive implications. According to security professionals recently consulted by networking hardware company Cisco, operations (38%) of a firm is likely to be affected the greatest by any potential cyber attacks and breaches. After operations, finances (29%), intellectual property (27%), brand reputation (27%) and customer retention (25%) are most at risk. Knowing that no firm with serious ambition to perform successfully and achieve favourable results wants to be in a position of having critical functions compromised, SavoyStewart.co.uk analysed findings from Gov.uk to see how much money 811 UK firms from a range of sectors invested in cyber security during the financial year of April 2017 to March 2018. SavoyStewart.co.uk found that firms in finance and insurance invested the most money on cyber security at a significant average of £17,900. This marked a phenomenal 85% increase from the previous financial year, when finance and insurance firms were spending an average of £9,650. Thereafter, firms in the transport and storage sector invested the second highest amount of money in cyber security at an average of £6,570, a small increase of 9% from the financial year before (£6,040). The research also revealed that, firms in the entertainment, service and membership industry invested the least money on cyber security at a mere average of £770. This marked the biggest decrease in cyber security investment from all the considered sectors, an 82% drop from 2016-17, when firms within the sectors were splashing a heftier average of £4,380. Investing slightly more than the entertainment/service/membership industry, firms in food and hospitality forked out an average of £900 on cyber security. 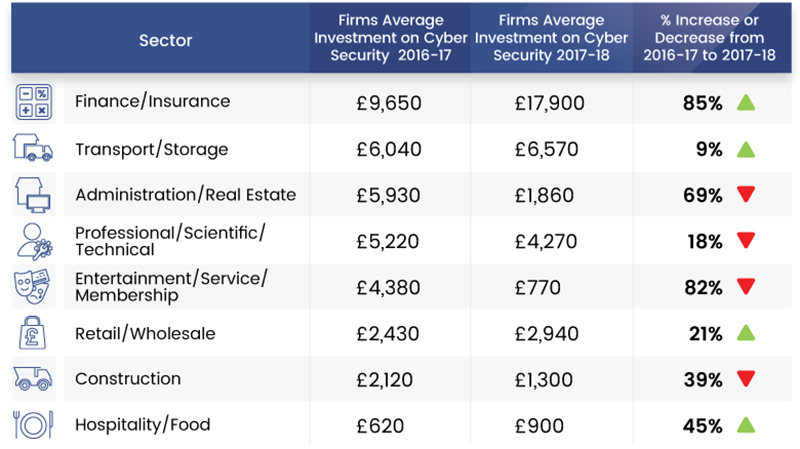 Despite this low sum, food and hospitality firms still managed to achieve the second highest increase in cyber security investment when compared to their average 2016-17 outlay of only £620. Darren Best, Managing Director of SavoyStewart.co.uk commented: “As the scale and sophistication of cyber attacks/breaches intensifies, firms cannot afford to sit back and take the importance of cyber security lightly. As firms now remain reliant on an online ecosystem to conduct business, they must realise their websites and digital communications can be easily targeted and exposed to cyber attacks and breaches. So key decision makers need to put an urgent spotlight on cyber security by placing it high on their agenda. This includes investing a sufficient amount of money to ensure their IT estate has the capabilities to consistently get basic defences right and establishing adequate governance on cyber security for employees to thoroughly follow”.